Last month, the folks at Mugen released a massive 6,500 mAh battery for Samsung Galaxy Note 3 that can give you almost double battery time compared to the original Note 3 battery. If you’re consumption is still more or you find the battery life provided by the original battery to be insufficient, Zerolemon is offering the most powerful battery currently available in the market with a whopping 10,000 mAh capacity. The massive 10,000 battery will ensure that you get a battery time of around two days after moderate to heavy usage. The battery comes with a $59.99 price tag, but you also get a few other goodies with the package as well. The battery comes with a rugged case that provides users with multiple layers of protection and allows customers to use any size battery. The package also includes a belt clip holster that also doubles as a kickstand and a free screen protector. The battery comes with 180 days ZeroLemon warranty with Amazon as well as a 30-day money back guarantee. The battery ships worldwide, but users outside the United States may have to incur extra shipping charges in addition to the $59.99 cost. 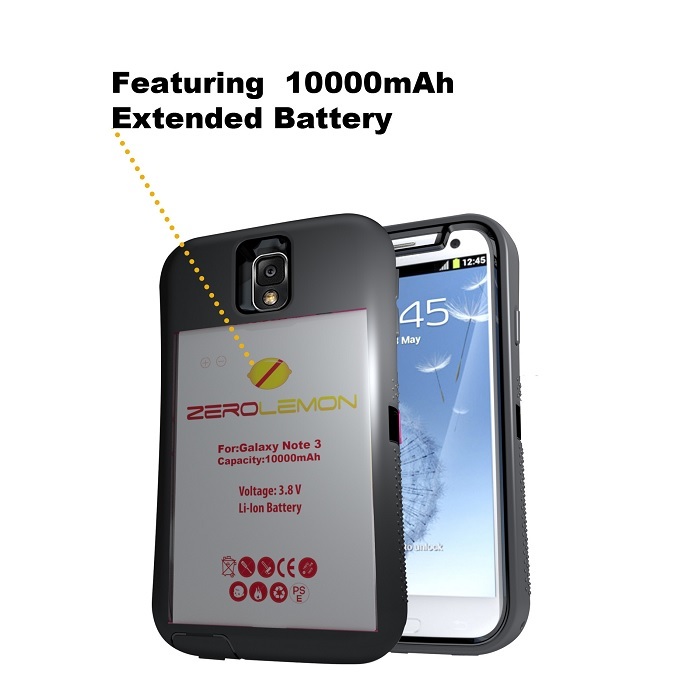 Just hit the source link below if you’re interested in purchasing the ZeroLemon 10,000 mAh battery.